At a primary school in the province of Belluno, Italy students show that there is more to a CD than music or text. Each reflection from the silvery discs is surrounded by coloured rings. How? 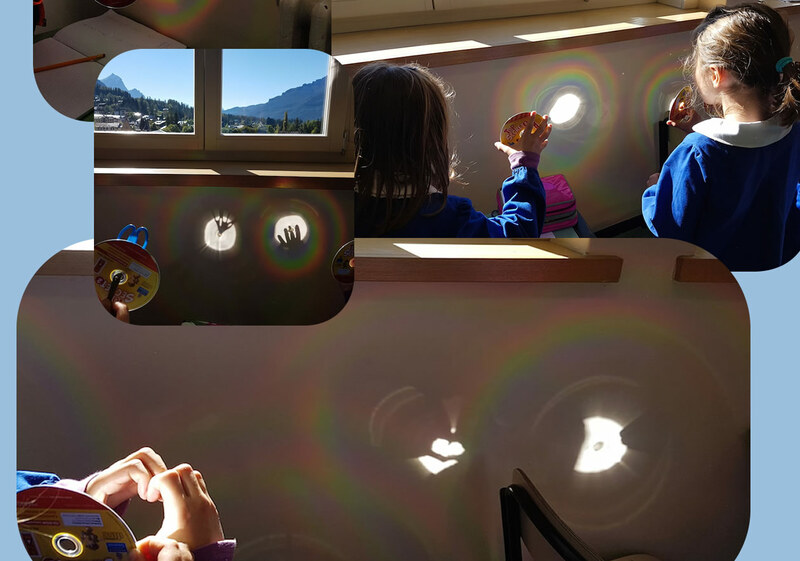 "During an English lesson on colors, a student played with the CD that came with the English book, creating a circular rainbow around its sun reflection. I too like to create rainbows with a CD, but I never got colors so clear and well distributed. 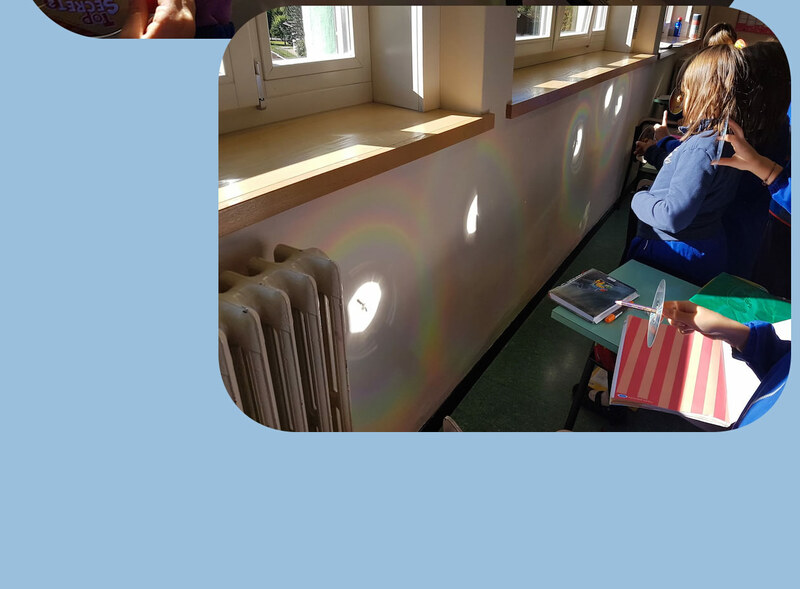 The game involved other children too and as you can see in the pictures, they also created shadows within the color projection. Then, of course, we continued with the lesson with CDs that were still all working." Marcella Giulia Pace (greenflash.photo) described and pictured the scene. The overlap condition for strong outgoing waves occurs at several angles giving first order, second order, third order.. ..diffraction rings. Sunlight shines on the disc. Each pit scatters the light. Each line of pits creates a wave stream or train. In some directions the waves overlap to make a strong outgoing light beam. At other angles the waves cancel each other out. The directions of strong light depend on light wavelength and the sunlight splits into spectra. Scattering with the outgoing waves combining constructively and destructively is diffraction or interference. Linear arrays of scatterers are diffraction gratings. Single particle diffraction is a little different. A spiral of tiny pits carries the CD information. Unlike an old vinyl record the spiral reads from the centre outwards. Each twist of the spiral is only just over a micron (1/1000mm) from the next. An atomic force microscope pictures them here.